The move to include the ribbon in SharePoint provides additional challenges to site designers. They have to include it somehow in their designs, as the ribbon is here to stay. One of our clients had an own navigation menu that he wanted to integrate with the ribbon. The problem is that this menu is dynamic and can change at any moment in time. And the SharePoint 2010 ribbon is static by nature. It is defined in XML files on startup. That made me wonder whether it would be possible to dynamically add menu items to controls, tabs and groups. I then stumbled upon a blog post by a company called ICC here that described a method of dynamic flyout anchors. Another post described here by Tom Wilson described how we could change the look and feel of the ribbon to fit the internal company design. Define the Tab, Group and Control elements. So, what did we just include? In this XML, we define a custom action that will add a Tab to our ribbon called Boom.Ribbon.EnterpriseTab. In there, we define some scaling on how the controls in the groups should be rendered and obviously, the groups itself. In this example, I only defined one group called MyCompany for simplicity, although I did added scaling for additional groups. For the purpose of this blog however, we keep it with one group. In the group, we define a single FlyoutAnchor control that will be the focus subject on this blog. For additional information about the Tab and Group definition, there are many articles out there that describe these. For instance, refer to the blogs by Chris O’Brien on this subject. So let us take a closer look at the FlyoutAnchor node. The Id and Command attributes follow the naming convention (project-ribbon-tab-group) as best practice, although they can be anything you like. The following attributes are of more interest: PopulateDynamically, PopulateOnlyOnce and PopulateQueryCommand. These three attributes determine that the controls in this menu will be populated dynamically. PopulateOnlyOnce determines that this will only happen the first time it is loaded, which we set to false. The PopulateQueryCommand specifies the command that will be called to populate the control. The command has to set the properties.PopulationXml property with the exact declarative XML as we would use when not loading dynamically. We will get to that part later. But, as one can see, the command mentioned in the PopulateQueryCommand is not registered in the CommandUIHandlers section of the XML. This is because we will do this registration on the server side. We do however register two commands that make the control enabled (Boom.Ribbon.Enterprise.MyCompany.Menu) and the command that each button will execute when clicked (DynamicButtonCommand). So, how do we now wire the commands to this definition? We will get to that when we solve another problem. The above declared tab will not show up in our interface if we deploy this solution now. That is because we have omitted the RegistrationId and RegistrationType attributes in our custom action, meaning it is not tied to any context yet. As we want the tab to appear always, we have to make sure that the tab is made visible when each page loads. We do this by inserting a custom control that will do this in the pre-render phase of the page, using the AdditionalPageHead control placeholder. And since we then have a control anyway, we can also use that to wire the commands of our tab. So, add a custom class to the project. I have not included it in its own directory, but you could. I called this class CompanyTabLoader.cs. How do we ensure this is loaded on each page? Well, that is accomplished by adding the Control element at the beginning of above XML (or end if you like). Some nice bonus in above declaration. We use the VS 2010 placeholders for adding our complete assembly name upon deployment, so we do not have to fill that in ourselves ;-). By far, this is the easiest way to get code running on each page. As shown, this declaration tells SharePoint to include our custom control in each page by adding it to the AdditionalPageHead container. Now, we can add code to our custom control to complete the wiring of all our events. To make sure our tab is visible on each page we need to call some methods in the PreRender event of our control. Override the OnPreRender event of our base class and add the following code. (Make sure CompanyTabLoader.cs inhereits from System.Web.UI.WebControls.WebControl. Also add references to our project to the following assemblies: Microsoft.SharePoint.dll, System.Web.dll, Microsoft.Web.CommandUI.dll. No real specifics here. As you can see, I declare a namespace and a class (prototype) to handle various events on the ribbon. Also some constructors (initializers) are declared here. The actual wiring to our custom controls will be done in code. You can reuse this page component for other extensions to the ribbon if desired. Now we need to register our page component and our custom commands with the page. We move back to our custom control called CompanyTabLoader.cs. In the OnPreRender event, we create a new generic list of IRibbonCommand that will hold our custom commands. We add a new SPRibbonCommand to that list that wires our PopulateDynamicMenuItemsQueryCommand to a command on the ribbon. We create an instance of the SPRibbonScriptManager class and add the initialize function of our page component. After that, we register our commands with the three events of our page component that return an instance of the event, getGlobalCommands, commandEnabled and handleCommand. The last will be called when a command is executed on the ribbon in our page component. We should now wire our server side method mentioned in the command. /// RaiseCallbackEvent event and perform transformation there. // This function will receive the callback from the server with the menu items. The menuXml variable is used to assign it to the properties.PopulationXML in our command declaration. 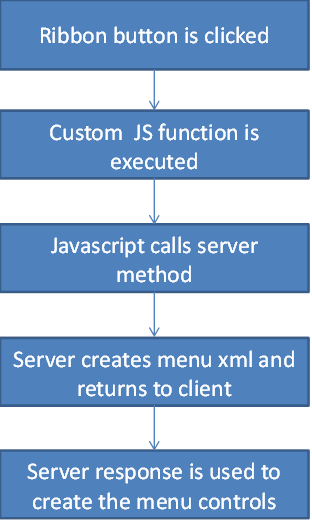 The ReceiveServerMenu function is referenced in our callback reference declaration above. This is the callback function that will be called when the server completes its request. The return value of that function will be assigned to the ‘arg’ argument passed. In the method, we then assign the return value to the menuXml variable (which in turn will be assigned to the properties.PopulationXML in the command), which completes our circle. Now that we have completed our coding, all we have to do is click and deploy and watch the fruits of our labor. If you are lucky, you will see something similar to below. Be patient on the first load though, as the web application still needs to spin up. Although I have not tried it, the controls that are dynamically created do not have to be buttons. It could also be FlyoutAnchor’s again, which creates nested menus. Because we can customize also the look and feel of the ribbon, it would be possible to make it look like a normal menu, as seen many times on sites. 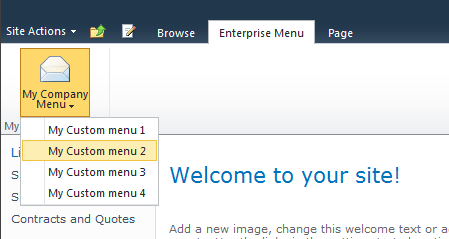 Menu items could easily be added or removed, without the need to redeploy code. Disadvantages can primarily be found on networks with high latency, where this approach would not be valuable. The menu would simple take too long to load. Secondly, this approach would be rather ‘chatty’, meaning a lot of request would go back and forth. Some kind of caching mechanism on the server side is preferred. Anyway, it does show all the possibilities you have with the ribbon. Dynamic controls, server side processing, dynamic command registration on the server, declarative commands, tabs and groups. Have fun playing around with this. The example project with code can be downloaded here. It seems like multiple people have issues with the pageComponent.js class as at regular times, it throws a JS error. This is also true for SP 2013. It occurs with getGlobalCommands() function. In this post people solved it by implementing the exact commands to execute. Unfortunately, I have no other solution.